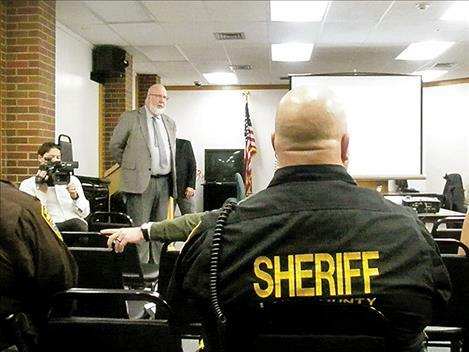 Jail Captain Joel Shearer, right, listens to Mark Martin during a town hall meeting about a jail assessment on Friday. Undersheriff Ben Woods, left, listens to consultant Mark Goldman. 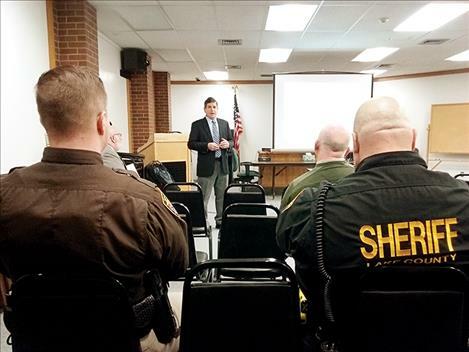 POLSON — The need for a new jail was the main topic of discussion at a town hall meeting on Friday, but what to do about it was largely left unanswered. Lake County’s 45-person jail is frequently over capacity and many arrestees are not incarcerated because there is no room. Sheriff Don Bell had two consultants come to town for three days last week for a jail and justice system assessment. Bell said that consultants Mark Martin and Mark Goldman, who were hired by the federal Department of Justice’s National Institute of Corrections, came at no cost to the county. Bell said he learned about the opportunity while attending a one-week training offered by the NIC in Denver last year. “My goal is to get the community involved behind the commissioners,” he said during a break at Friday’s meeting. The county’s current budget calls for planning for a new district courtroom and a jail assessment, but those plans have been put on hold, Commissioner Dave Stipe said. He noted that deputy county attorney Wally Congdon recently found out about a state law that limits any levy the commissioners can approve to $2 million. A new justice or jail facility would likely cost upwards of $15 million, Stipe said, which would require a vote of the people. Whether or not the commissioners would ask the public to approve such a levy is unknown at this time. “We’re stuck between two laws,” Stipe said, referring to a law that requires the 20th Judicial District to add another courtroom and the limitation on commissioners of approving a levy of more than $2 million. “Our justice system is a four-horse wagon,” he said, noting that federal, state, tribal and county governments are all responsible. Stipe said there is co-jurisdiction among these four entities, but noted that the federal, state and tribal entities haven’t been willing to help pay for any required or necessary expansions or additions of the jail or court. During the Dec. 1 meeting consultants noted numerous issues that exist with the jail, which Commissioner Bill Barron said was built in 1938. Somewhat high staff turnover rates, insufficient bed capacity and significant facility deficiencies are just some of the issues. All parties recognize the need for a new facility, Martin said. He added that the incidence of substance abuse and mental health issues among the jail’s inmate population have skyrocketed. “It’s a population much different than 2007,” he said, referring to the last jail assessment done in Lake County. Bell noted that an upgraded assessment was conducted in 2009 that resulted in a voter-approved levy which added three school resource officers, two dispatch employees and two detention officers. Martin said more community resources are needed in Lake County, such as a mental health court and expanded drug court. Other examples of deficiencies include: metal bars and protrusions that could be used for suicides, manual locks that prohibit prompt evacuation and low ceilings with exposed pipes and wiring. The available cells and housing units are not matched to the needs of the jail population, Martin said. The one elevator in the courthouse is shared by members of the public, inmates and jail staff, for example. The recreation room, which was to be used two hours a day for exercise, is now used for housing inmates. Poor ventilation, noise and lack of natural light are quality of life issues for both inmates and jail staff, Martin said. In addition, maintenance has fallen behind because jail staff doesn’t have the time to take cells out of service. “You’ve added some Band-Aids over time, but they haven’t helped that much,” Goldman said. “I know if I was in there I would become severely depressed,” he said, referring to the lack of natural light and other issues. One of those Band-Aids was noted by Barron: a concrete or “sally slab” was placed in front of the jail entrance so deputies could park there and shorten the length of time and distance needed to walk an arrestee into the jail. Goldman said the next step — should the commissioners decide to proceed — would involve a detailed jail needs assessment that ideally would involve a jail planner and a jail advisory group made up of local residents.